CDF and many other CDEs participating in the NMTC program typically uses the “leverage model” to generate additional capital to provide “gap financing” for projects and businesses, as illustrated in the diagram below. In the leverage model, the tax credit investor (typically a bank) creates an investment fund to pool tax credit equity with other financing sources. The total tax credit available to the investor is equal to 39% of the total deal size, or Qualified Equity Investment (QEI) amount. The investor’s tax credit equity investment up-front is based on the amount of benefit the investor will ultimately claim. Because the investor’s claim of the tax credit occurs gradually over the 7-year NMTC compliance period, the NMTC equity amount will reflect a discount against the full 39% NMTC benefit to reflect time-value-of-money. For example, if an investor pays $0.77 per $1 of tax benefit, this translates into $0.30 of NMTC equity per $1 of total QEI invested ($0.77 x 39%). Therefore, on a $10 million NMTC transaction with $0.77 pricing, the NMTC investor would be entitled to $3.9 million of tax credits over 7 years and would pay in about $3 million of NMTC equity into the investment fund at closing. However, in order to claim this amount of tax credits, the investor (through the Investment Fund) needs to make a $10 million Qualified Equity Investment in the CDE. Therefore, the Investment Fund typically borrows the rest of the capital needed to fund the QEI. This loan is called a “leverage loan.” Leverage loan proceeds are sourced from a number of different types of capital depending on the nature of the project. Leverage sources have included commercial bank loans, bridge loans, grant proceeds, charitable donations, tax increment financing (TIF), HUD 108 loans, and others. In almost every case, all sources of funds flow simultaneously at NMTC closing, requiring that the Leverage Loan, NMTC equity, and any other sources be available and ready to fund at or prior to closing. 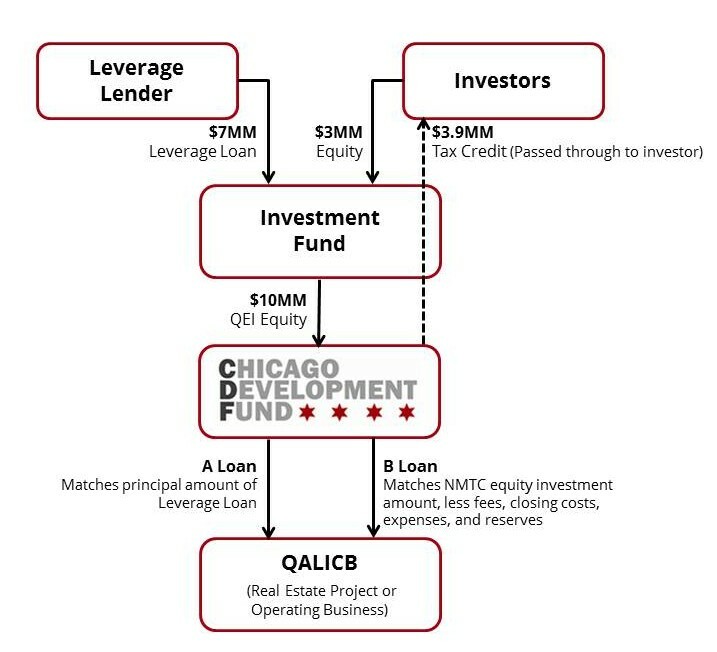 Chicago Development Fund often structure QLICI loans in two pieces, to mirror the leverage loan and the NMTC equity layers at the investment fund level. The A Loan amount mirrors the leverage loan amount, while the B Loan mirrors the tax credit equity amount net of fees, closing costs, and NMTC-related expenses. At the end of the seven year NMTC compliance period, the Project Sponsor frequently has the opportunity to purchase the B Loan via a “put/call” agreement for a low cost, thus converting the B Loan into a permanent subsidy to the project. This net subsidy is generally about 20% of the total financing amount.